Why should I visit the Galapagos Islands? 2018 was really something else, an odd year that left many folks scratching their heads. So, why not make 2019 really shine with an adventure full of unique experiences in a place you’ll always remember for its warmth, excitement, and emotion? It could be that now is the perfect time to visit a once-in-a-lifetime destination and the Galapagos Islands certainly fits the bill. Year-after-year, the archipelago ranks as a Top Destination in the World. It truly is a special place that offers visitors the chance to see wildlife that you can’t see anywhere else on the planet. 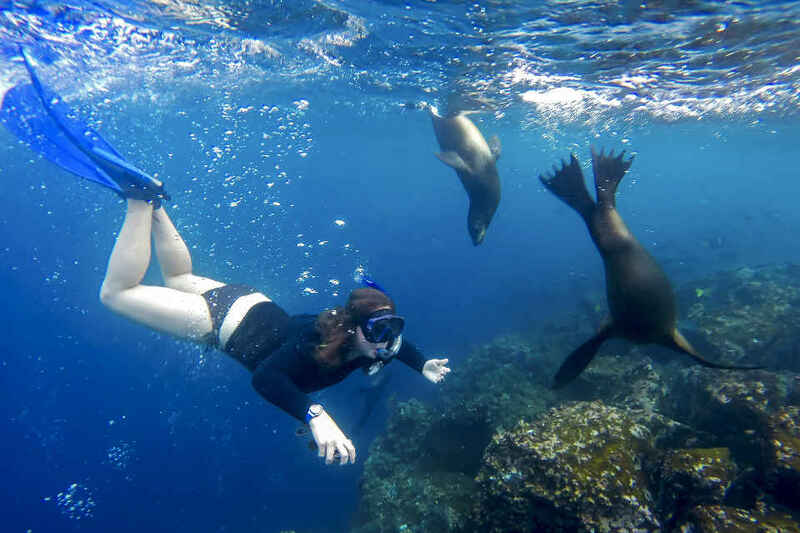 In this blog, we explore 5 reasons why you should visit the Galapagos Islands. Have you ever wondered, “When is the best time to visit the Galapagos?” One of the great reasons why traveling to Galapagos is an option at any time of the year is because of its very agreeable climate, thanks in large part to its location on the equator. If you want to spend some time in the Enchanted Isles, whether it be in January, December, or any month in between, you’ll always see iconic species and enjoy some of the most enjoyable weather around. Temperatures are ideal both on land and at sea. It never rains for too long, and the mere awe of this amazing place sets the tone for an unparalleled experience. The Galapagos Islands are one of the best places to see endemic wildlife –meaning, that some of these animals only exist in the archipelago and nowhere else in the world! Recently, Condé Nast Traveler named the archipelago one of the 15 Best Places to See Wildlife Up Close. A remote location such as this one, with no predators, means that there are greater numbers of species unfazed by the presence of humans. Simply put, this means thatanimals, such as the marine iguana, flightless cormorant, Santa Fe land iguana, Galapagos giant tortoise, Galapagos fur seal, and Galapagos penguin are abundant and can be seen readily and at a surprisingly close distance! Recently Found Tortoises on Fernandina? The archipelago is home to dozens of species unique to the Galapagos. One that had long been thought extinct, the Fernandina Island Galapagos tortoise, was recently discovered on Fernandina Island and brought to a breeding center on Santa Cruz for purposes of conservation and genetic testing. It had last been seen over one hundred years ago, in 1906. The Galapagos Islands are home to some of the most breathtaking and inspiring landscapes. Three of the archipelago’s most outstanding beaches (listed below) feature on Flight Network’s list of the World’s Best Beaches in South America, as highlighted by Forbes. Red Sand Beach (Rabida Island) boasts a deep red, crushed volcanic shoreline with a high iron content that accounts for its stunning color. Tortuga Bay (Santa Cruz) is one of the most pristine, white sand beaches in the Galapagos, and the nearby inlets are ideal spots for relaxing, swimming, surfing, and other beach activities. Cormorant Point (Floreana Island) is notable for its ground coral sand, the presence of pink flamingoes, green sea turtles, and stingrays. To fully absorb the beautiful and intricate layout of the Galapagos, one needs only to observe and explore. Each of the islands in the archipelago has a number of distinct qualities, and if you’re interested in seeing all there is to see, your best alternative may be a cruise-based option. If the idea of actively exploring different visitor sites on a daily basis while using an expedition vessel as your home base is not your thing, you may want to consider a land-based option. This alternative allows you to spend more time enjoying an inhabited island (along with one or two nearby visitor sites), exploring on your own, or taking day trips on smaller vessels. There’s no right or wrong answer. It’s entirely up to you. In all, there are almost 70 vessels in the Galapagos. Of these, only about 18 offer multi-guided activities. The thing to remember is that 97% of the archipelago is part of a Galapagos National Park. The number one rule for the park is that visitors must always be accompanied by a registered Naturalist Guide. Aboard most vessels, you’ll find about one guide for every 16 passengers. This ratio is fairly high compared with a few select boats that average one guide for every 11 passengers. When there are more guides aboard a particular vessel, there are more activities for guests to choose from. This means that some folks can explore the coastline via an activity like snorkeling while others can do some paddleboarding or a little hiking. Simultaneous exploration activities thanks to multiple guides – this is key to enjoying a cruise-based option. There are a number of things to keep in mind when looking for your perfect Galapagos cruise. You can think of these as useful hacks for choosing the best Galapagos Cruise. Land-based options, on the other hand, can offer you the peace, tranquility, and relaxation you need if your aim is to get away, do a little exploring, and enjoy some valuable time and relaxation in a truly incredible place. If this is the case, comfort is key. Also, you will want to dedicate a day or two to seeing the coastline and wildlife via boat. There are numerous day excursions one can take from the larger, inhabited islands. Some of these properties even have their own yacht. The important things to consider when selecting a land-based option are: whether they offer scheduling of day trips, whether they have exploration tools and equipment for different activities (biking, snorkeling, paddleboarding, surfing), and which of these and other activities are guided. The Galapagos is one of the top scuba diving destinations in the world, being that the United Nations has declared it a Biosphere Reserve and that CEDAM International named it “One of the seven underwater wonders of the world”. In the archipelago, only licensed, experienced divers with 25 logged dives or more can participate in this activity, (unless, as a rare exception, the licensed diver is evaluated and approved by an expert guide). There are two options; either live-aboard diving cruises with typical week-long itineraries, offering three dives per day, but no land visits, or day excursions, diving off a small yacht. For scuba aficionados, this destination is undoubtedly a must. 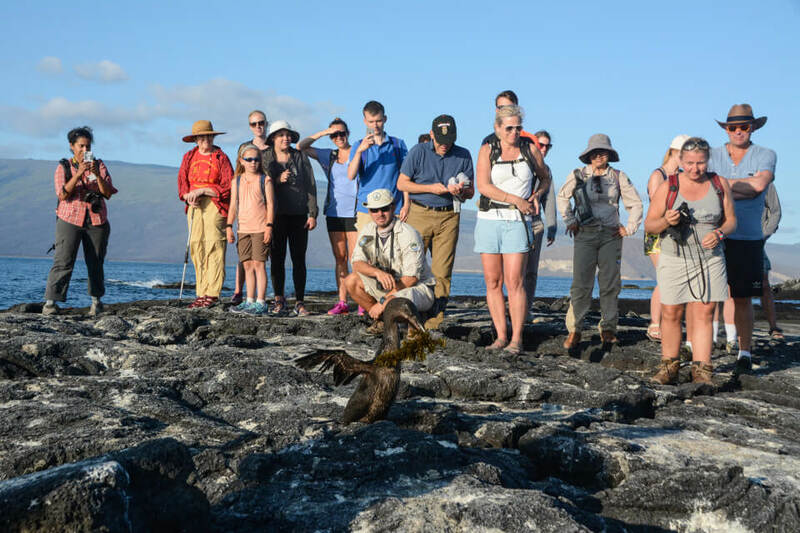 Book your Galapagos tour this 2019 with Metropolitan Touring, today! The Galapagos were declared a World Heritage Site by the United Nations Educational, Scientific, and Cultural Organization (UNESCO) in the late 70s. In the wake of this recognition, being a place that is so popular and beautiful, yet fragile and delicate requires some really intense conservation efforts. Environmental responsibility is enshrined in many of the people that live and work in the archipelago. Given the vast amount of stakeholders, some with competing interests (fishing and tourism industries vs. conservation and environmental protection efforts), the decision-making process has not been an easy one in the islands. A law was passed in 1986 to control fishing and over-exploitation in the Galapagos, recognizing the waters in and around the archipelago as a vital Biosphere Reserve. The protection of the islands and oceans became the responsibility of the Galapagos National Park Service (GNP), which was established in 1959 and is currently celebrating its 60th year. One thing to understand is that the Galapagos are not as heavily transited as you might think. Thanks to a limited number of vessels, hotels, and yearly visitors, the Galapagos National Park Service can more efficiently monitor and regulate travel and activity in the region. The regulations and participation of various operators in joint conservation efforts is a particularly good thing. 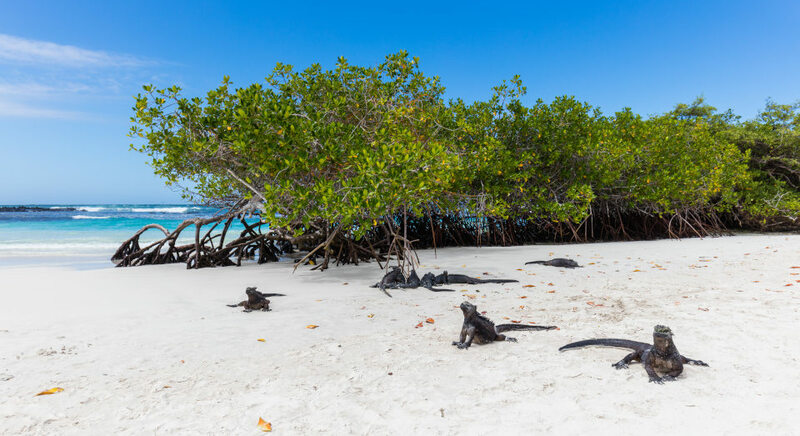 As an example, the GNP recently relocated about 1400 marine iguanas from North Seymor to neighboring Santiago Island at the beginning of 2019. Until 2004, Santiago Island had been overrun by feral pigs, cats, and rodents. These herbivores are expected to help restore the island’s vegetation to what it once was. 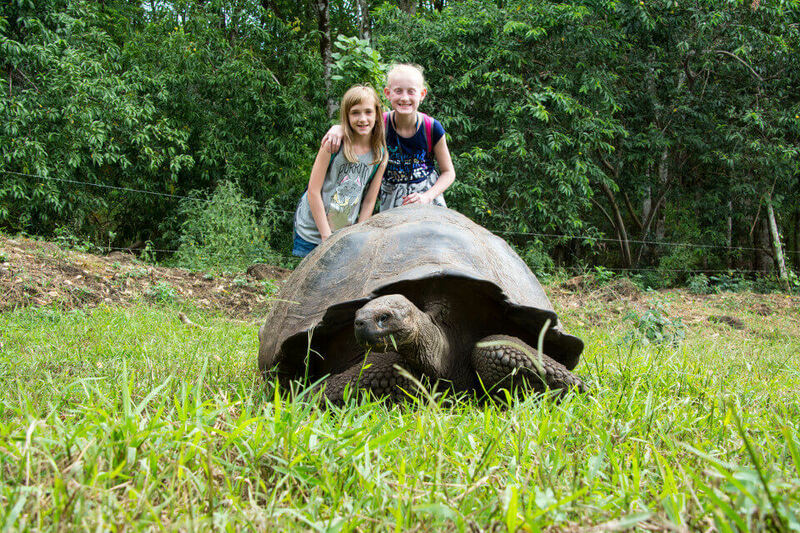 Need an extra reason to visit the Galapagos? All flights to the archipelago are domestic and depart from either Guayaquil (airport code: GYE) or the capital city of Quito (UIO). In 2018, Quito celebrated its 40th anniversary as a UNESCO World Heritage Site and it was recently selected by Condé Nast Traveler as one of the 50 Most Beautiful Cities in the World Its Historic Center is one of the most well preserved, attractive, and functioning cultural areas in all of Latin America. Gorgeous cobblestone plazas, elaborate gothic churches, balcony-lined houses, cultural museums, artisanal shops, cafés, restaurants, and neighborhood parks inspire visitors with a sense of excitement and nostalgia. In the heart of this city center is San Francisco Plaza, a historically important area filled with activity and flanked on one side by its namesake church and convent, and on another, by the recently transformed historic mansion that is now the Casa Gangotena Boutique Hotel. Whether traveling through on your way to or from the Galapagos, it is worth considering a quick stop in Quito. How do our guests experience the Galapagos aboard our Expedition Vessels?